Over the last few decades, the promise of nanoscience and nanomaterials has been realized through both fundamental and applied research that benefits society. 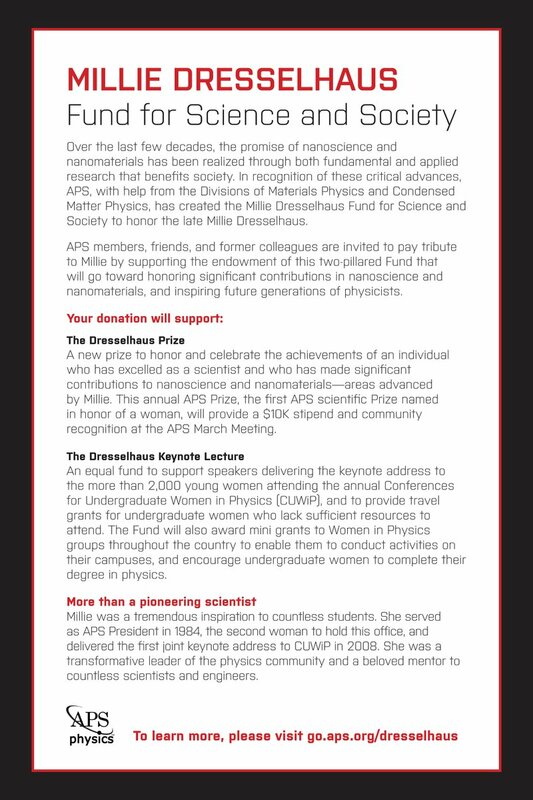 In recognition of these critical advances, APS, with help from the Divisions of Materials Physics and Condensed Matter Physics, has created the Millie Dresselhaus Fund for Science and Society to honor the late Millie Dresselhaus. This Fund will support the Dresselhaus Prize, the first APS prize named in honor of a woman, and the Dresselhaus Keynote Lecture, which will provide opportunities and mini-grants to undergraduate women in physics. 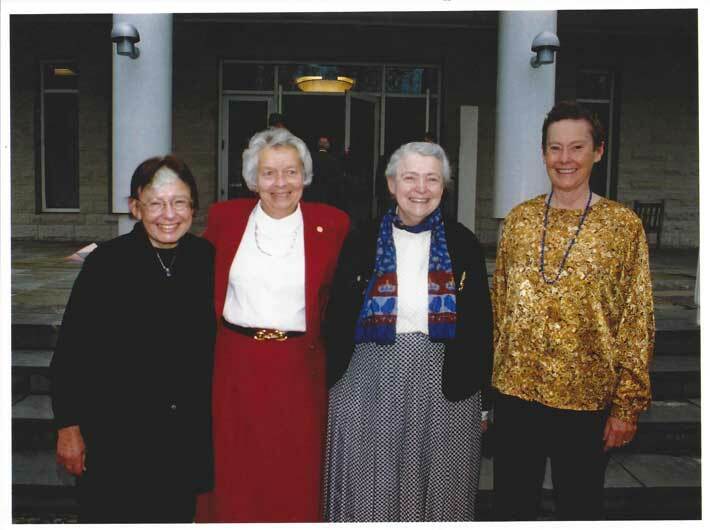 In concert with the establishment of this two-pillared Fund, APS and AIP have given permission to reprint excerpts of an article Millie wrote in 1985, “Perspectives on the Presidency of the American Physical Society”, in which she reflects on what it was like to be president of APS. It may seem surprising that the most frequent question I was asked during the year I served as president of The American Physical Society was “how it felt” to be president of this distinguished and venerable society. This question is perhaps not so surprising when you consider that the probability for a physicist to experience personally this challenge is only on the order of one chance in a thousand. In this article, I will attempt to give one operational answer to this complex question. I must admit that I was caught completely by surprise when the chairman of the APS nominating committee called to ask if I would run for vice-president of APS. I could hardly believe that I was a serious candidate. After consulting my family, my boss, my colleagues, and a few close friends, I concluded that while I didn’t have much of a chance to win the election, this would be a fine opportunity to voice some of my priorities for APS, for physics, and for physicists. My boss at MIT assured me that the most valuable contribution that MIT could make to women in science was for me to take this proposition seriously. He did not, however, take my nomination seriously enough to factor the possibility of my election into my work assignments for the coming years. With these words of encouragement, I accepted the nomination and proceeded to prepare an upbeat, liberal platform aimed at young physicists and industrial physicists. I called for increased participation of the younger, more active physicists in the leadership of APS; I supported increased APS sponsorship of studies on technical issues of national concern; and I said APS should work to increase the scientific literacy of the general public, so that citizens can better make decisions on issues that involve the interface between science and society. My husband and close friends liked my platform, but thought it was too radical for winning the election. This assessment turned out to be wrong. I honestly believe that I won the election because of my activist platform. My opponent was a truly distinguished physicist with an excellent record of leadership in physics. I am certain that he would have been an outstanding APS president. Luckily, the forefathers of APS, in their wisdom, framed the organization’s constitution to give the president a two-year apprenticeship prior to inauguration. For me, those two years as vice-president and president-elect were absolutely essential, because there was so much to learn about ongoing APS programs, committee activities and people who carry out the work of the society. Thus, upon election, I plunged into the work of APS with much enthusiasm and dedication. My life has not been the same since my election to the APS presidential line. To be sure, serving the society has involved a lot of hard work, but the personal rewards have also been tremendous. First, it has been a marvelous experience to work with so many distinguished physicists and thoughtful people. But more than that, being exposed to such a wide variety of physics has been truly enriching, something like going back to graduate school. I was especially fortunate to have been president during the year that the National Academy of Sciences Physics Survey Committee was in full operation. It has become the custom that in every decade (at least for the past two decades) there is a review to note progress in physics for the preceding decade and to identify exciting research opportunities for the coming decade. Because of my APS position, I was invited to serve as a member of the NAS Physics Survey Committee. This experience has broadened my knowledge of physics and of science policy, and has given me a deeper understanding of the relation of my own research work to the broader framework of physics. As the survey was nearing completion, members of the survey committee felt that the year of my presidency would be an especially opportune time to conduct a physics briefing for George Keyworth, President Reagan’s science adviser. Hans Frauenfelder, representing the NAS Board on Physics, and I, representing The American Physical Society, were designated co-chairmen of the Physics Briefing Committee. This undertaking, like the physics survey, was a truly rewarding scientific experience. The ground rule for the physics briefing was that we were to identify a few, select research opportunities where a small amount of additional funding could have a major scientific impact. We prepared a short briefing paper and made oral presentations to funding-agency leaders as well as to Keyworth. Recent fundamental advances in physics demonstrate that physics is still in a golden age and has never been more vigorous or more productively interactive with other fields. Progress in physics over the last decade has been remarkable. Puzzles that seemed to present insuperable challenges at the beginning of the 1970s have yielded to powerful and elegant theoretical and experimental techniques. 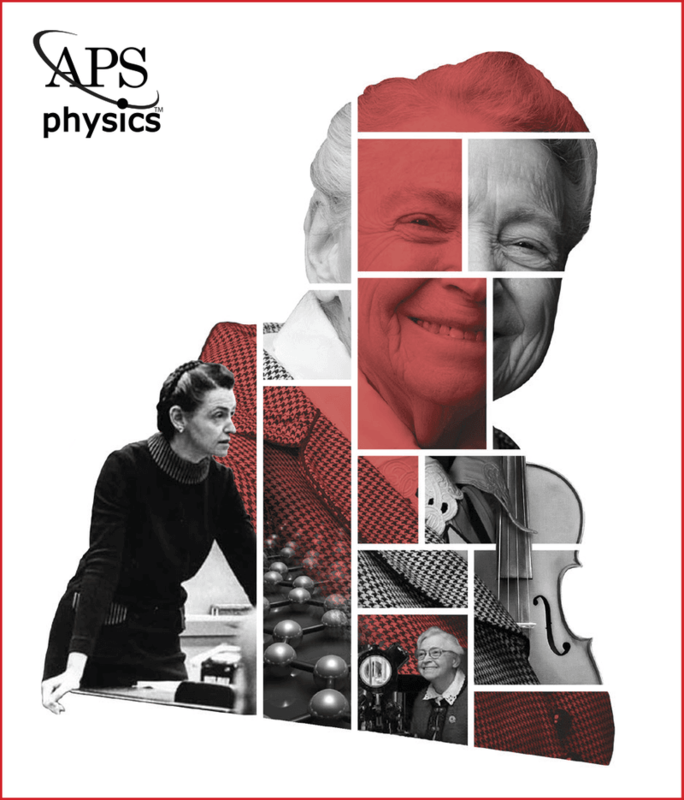 The new insights and accomplishments have not only brought greater unity to the various branches of physics but have also strengthened the ties of physics to other areas of science and opened a vast array of new opportunities. Every part of physics has participated in the advance. Perusing the program of the March 1985 APS meeting, actually listening to the invited and contributed papers and talking to people in the hallways, all strongly confirmed the essence of this quotation. Overview is invaluable. 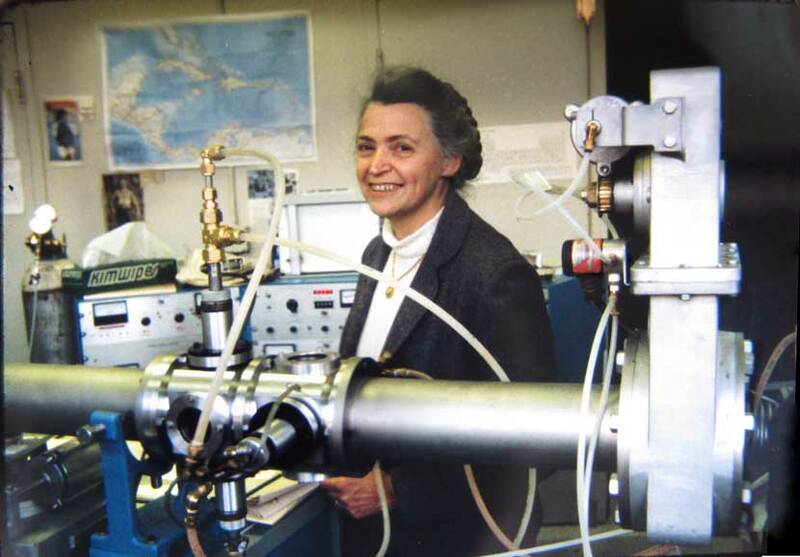 After I completed my graduate studies, I worked for two years as a postdoc at Cornell and then took a permanent position in the solid-state physics division of the MIT Lincoln Laboratory. While those were very productive years, I became more and more of an expert in an increasingly narrow field. Becoming a professor at MIT and teaching solid-state physics courses, being a laboratory director at the MIT Center for Materials Science and Engineering and serving on numerous national committees, all helped broaden my appreciation of physics. However, working on the NAS Physics Survey Committee and on the physics briefing was the most broadening experience I have yet had. It has expanded my horizons in physics and increased my appreciation of the unity of physics. I am truly grateful to APS for making this possible. My own research has been almost exclusively concerned with small science. In such fields of research, there are only a few scattered discoveries that change the course of research or unify the work of previous decades. Progress occurs in many areas in small steps that often seem disconnected. The long-term impact of a given contribution is often difficult to evaluate at the time of discovery. My experiences as APS president helped me see more connections between the work of our research group at MIT and some of the major thrusts of this decade in “small science.” The small patchwork pieces discovered in a multitude of small groups somehow fit together to form a large, beautiful, patchwork quilt. While I tried to remain active in research and teaching during my year as APS president, I devoted a significant fraction of my creative energy to providing leadership to The American Physical Society. This meant working closely with the APS Council, which is the governing body of APS, as well as with the executive secretary and the treasurer, who, as the society’s long-term officers, implement the policies legislated by the Council and provide skillful, efficient and devoted administrative support for society operations. My interactions with executive secretary William Havens and treasurer Joseph Burton were frequent and intense. An electronic mail system, acquired during my administration, made communication much easier. (See Physics Today, June 1984, page 81.) Because the APS president must address many issues that deal with science and public policy, I leaned heavily on L. Charles Hebel, chairman of the APS Panel on Public Affairs, and on Robert Park, director of the APS Office of Public Affairs in Washington. With publications such a vital APS activity, there were many occasions where I sought the expert guidance of editor-in-chief David Lazarus. International Cooperation. A luncheon for Chinese scholars in the American-Chinese program sponsored by APS and the Chinese Academy of Sciences and Ministry of Education. The Chinese scholars spend two years with research groups in the US. It was through my predecessor Robert Marshak that I got off to a running start on new programs for APS. Past-president Marshak is a great innovator whose interests as APS president focused strongly on international programs, arms control and merit evaluation of the funding of research. (See Physics Today, June 1984, page 44.) Marshak has a deep understanding of the international aspects of physics research and a humanitarian instinct for collaborative research programs. One was a program that each year brings approximately ten senior Chinese scholars to the US to spend two years in leading research groups, where they are trained to assume leadership positions in China. During my administration I worked to provide a proper framework for the operation of the program under steady-state conditions. 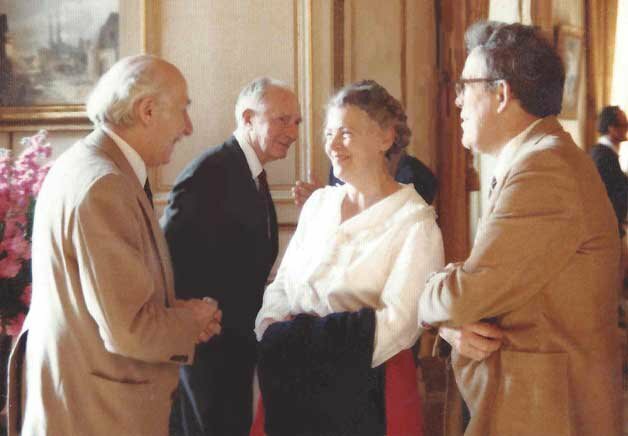 Marshak’s interest in physics in developing countries led to APS participation in the October 1984 Trieste conference of the International Union of Pure and Applied Physics. In this context I asked the APS Panel on Public Affairs Subcommittee on International Scientific Activities to consider appropriate long-term APS programs in developing countries. Purchase of spare parts for laboratory equipment. Because the Latin American assistance program was funded during my administration, I was involved with its implementation. Each of the five Latin American countries provided prioritized proposals in the four areas listed above, and an APS committee made recommendations for funding. Conceptually, this is a relatively cost-effective assistance program for physicists in developing countries. The Subcommittee on International Scientific Activities and APS’s new International Physics Group are now considering further application of this form of funding. Discussion. 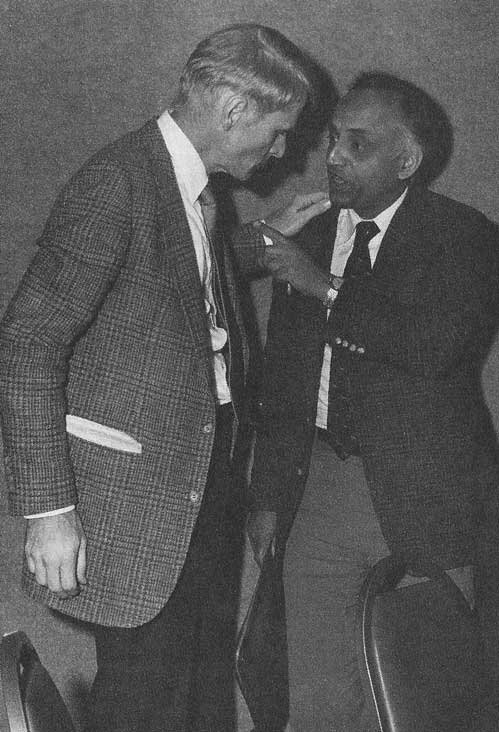 Venkatesh Narayanamurti, chairman of the Subcommittee on International Scientific Activities, talks with Bernard G. Silbernagel, chairman of the subcommittee's parent body, the APS Panel on Public Affairs. During the previous administration, the International Physics Group was formed and grew rapidly to a membership of 4,000. It was my responsibility to work out a mechanism for addressing the needs of APS in international physics and for addressing the needs of the constituency of the International Physics Group, whose members are broadly distributed around the world. During this past year, the complementary roles of the International Physics Group and the Subcommittee on International Scientific Activities have been defined operationally, and both groups have been operating effectively. Leo Falicov, chairman of the International Physics Group, and Bernd Crasemann and Venkatesh Narayanamurti, past and current chairmen of the Subcommittee on International Scientific Activities, played leading roles in pulling this activity together. The nuts and bolts of running physical societies, publications and meetings. Last May, the National Science Board asked me to offer written comments on the role of the National Science Foundation in international science. (Excerpts from these comments appear in Physics Today, November 1984, page 125.) This and other requests led to a number of valuable ideas, which the Subcommittee on International Scientific Activities is now discussing and extending. A briefing paper on the subject is nearing completion. Education Committee. Last year was particularly busy for the APS Committee on Education, as it focused on upgrading precollege math and science education. APS is emphasizing the goal of preparing each citizen to deal with the technological issues that confront the nation. Marshak’s interest in arms control led to the launching of an APS study on directed-energy weapons. (See Physics Today, June 1984, page 53.) The decision to proceed with this study was made at the November 1983 council meeting, after months of discussion. The Council felt that the need of the physics community and the population at large for more understanding of the technical issues surrounding the Strategic Defense Initiative outweighed the sensitivities and difficulties of carrying out such a study. There is ample evidence that APS members are very interested in this topic, independent of their political preferences. The study, under the leadership of co-chairmen Nicolaas Bloembergen and Kumar Patel, is off to a good start, and it is expected that the results will be published in Reviews of Modern Physics, with a popular version available for the media. During my administration, APS was also heavily involved with a major study commissioned by the Nuclear Regulatory Commission to assess what we know about the release of radionuclides during severe nuclear accidents. The “Nuclear Source Term” study panel, under the able leadership of Richard Wilson of Harvard University, examined the issue in detail. The panel’s report is now finished and will appear in a supplement to the July issue of Reviews of Modern Physics. (For a summary, see Physics Today, May, page 67.) The main findings were presented at the April 1985 APS meeting in Washington. The APS study concludes that for many accident scenarios, the quantity of radionuclides — especially radioactive cesium and iodine — released to the atmosphere would be much lower than predicted in the 1975 Rasmussen study of reactor safety. However, the study panel concluded that for some accident sequences the release of radioactive lanthanides could be larger than predicted in the 1975 study, due to interactions between the molten reactor core and the concrete containment vessel. Because of this, the APS study panel refused to support an American Nuclear Society study panel conclusion that the maximum radioactive release would always be much less than predicted in the 1975 report. The report of the APS study panel received substantial press coverage and attracted significant public attention. Rather than emphasizing the general agreement between the APS and American Nuclear Society reports, the press has focused on the small areas of disagreement. Merit review. During 1983 and 1984, approximately 15 institutions bypassed the normal merit-review process of proposal evaluation and obtained congressional authorization for academic programs valued at over $100 million. In many cases, universities hired professional lobbyists to steer the projects away from the normal pitfalls of merit review. With the encouragement of the APS Council, both Marshak and I were aggressive in attacking end-runs on the merit-review process. We wrote strong letters to Congressmen and Senators and we alerted other groups to what was happening. The flood of direct Congressional action emphasizes the severity of current difficulties with the funding of new facilities at universities. However, the Congressional activity has created major problems for government funding agencies, because Congress has not usually accompanied its authorizations of these new facilities with additional appropriations. The funding agencies have thus been compelled to curtail important ongoing physics research programs and to essentially eliminate new programs approved for funding by the normal merit-review process. Scientific communication. We gave a great deal of attention during the past year to keeping open the channels of scientific communication between physicists. Under Park’s dynamic leadership of the APS Office of Public Affairs in Washington, The American Physical Society has acquired a reputation for leadership in scientific communication and national security. 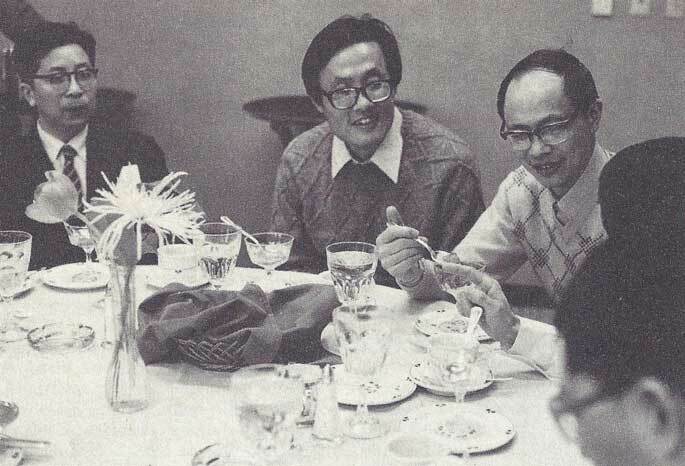 During 1984, we paid particular attention to enlisting the support of leaders of multinational corporations, exploiting the parallel needs of the research community and the industrial community in keeping the channels of communication open. APS could be especially helpful to the physics research community by disseminating information on specific needs for large, costly facilities, and by making known the exciting research that these facilities will make possible. APS could make this information available at meetings and through publications such as Physics Today and the Bulletin of The American Physical Society. APS could facilitate discussion among researchers within the physics community as well as discussion between researchers and key members of the funding agencies. APS could express concern about the future of university physics research and the training of graduate students, much of which involves research by small groups. Because most research physicists today work in small groups that do not use large, expensive facilities, and because these small groups are doing much of today’s forefront research, adequate support of “small science” is of great importance to the nation. Registration at American Physical Society meetings. 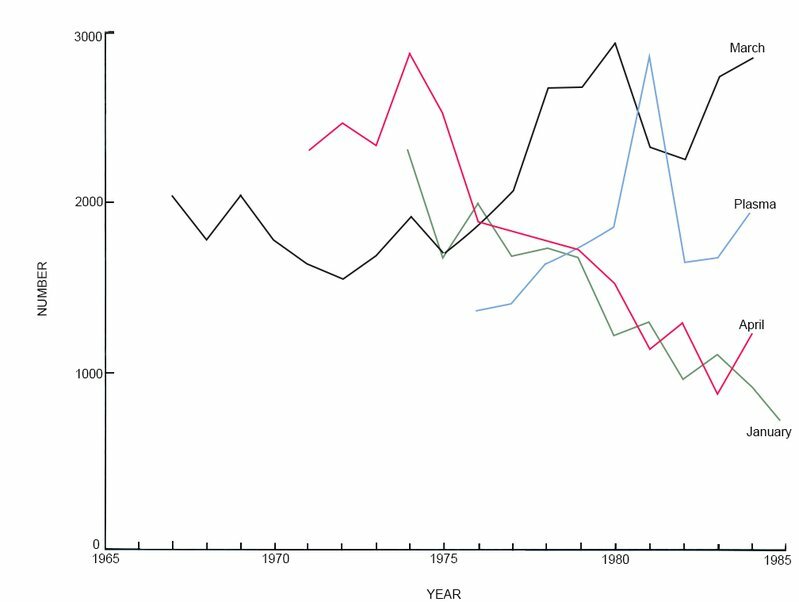 The above statistics on registration, together with those on contributed papers (given in the figure below), document the decline of the January and April meetings. 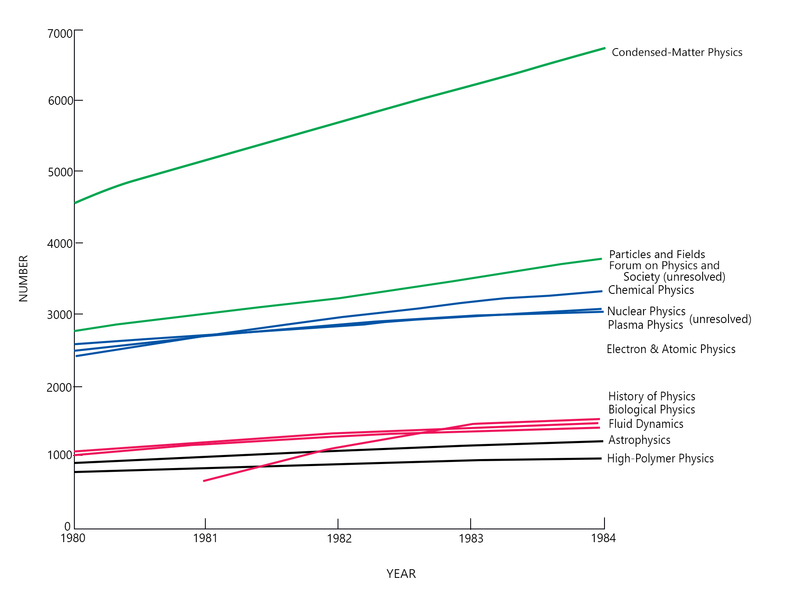 Papers contributed at American Physical Society meetings. An APS task force was addressing the problems that these long-term trends implied. To emphasize the unity of physics, meetings now feature general-interest sessions in the evenings to acquaint physicists with major advances in the various subfields of physics and to provide a forum for the discussion of current issues in science and society and in science and public policy. These general-interest sessions have already made a positive contribution to APS meetings. We look forward to further successes with this approach as we learn more about organizing and publicizing special-interest sessions to better match the interests of APS members. To improve the organization of the general meetings, we introduced program committees consisting of one representative from each participating division. The representatives are responsible for protecting the interests of their own divisions in the scheduling of contributed and invited papers. The growth of the March general meeting is closely linked to the increasing number of contributed papers and the growth of the various participating divisions (see the figures above and to the right). With the increasing size and complexity of this meeting, some organizational action seemed necessary. We hope that the program committee system will reduce the number of scheduling conflicts at the general meetings. 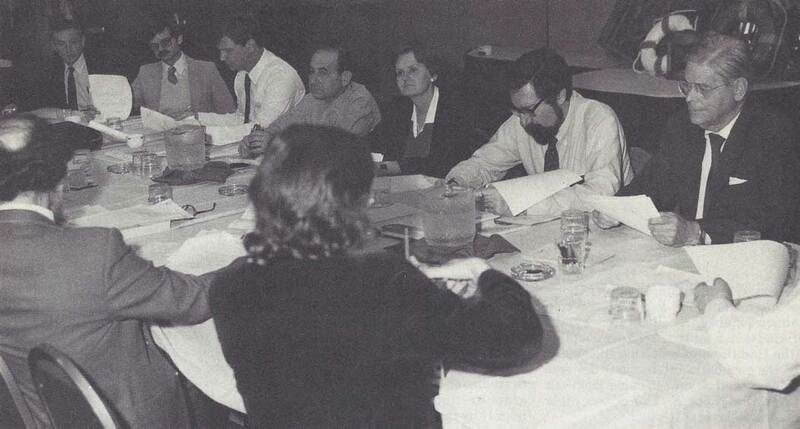 To make it convenient for physicists with common interests to organize sessions at APS meetings and initiate other activities that stimulate interaction among physicists with common interests, in 1983 the APS Council approved the concept of topical groups. Members with a common interest can now organize themselves and apply to the APS Council for official recognition as a topical group, which can then organize sessions at meetings. Five of these groups are now in operation. I believe that the formation of topical groups was necessary to meet the needs of members who are in large divisions, interdisciplinary areas and newly emerging fields. To take a longer-range view of its meetings, APS set up a task force on meetings. 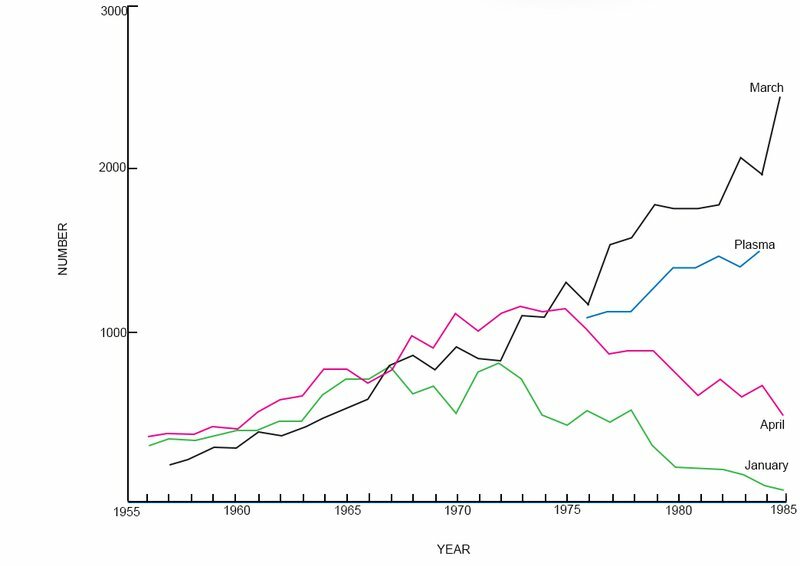 While it is clear that APS meetings make an important contribution to the advancement of physics — there were over 12,000 meeting participants in 1984— problems such as those highlighted by the figures at the beginning of this section indicate that we must now address the long-range goals for APS meetings. Physical Review and Physical Review Letters continue to flourish, and in many subfields have become the journals of choice for publication by physicists worldwide. In fact, major growth in these journals during the past two years is due to contributions from authors abroad. To give priority to publication of the best physics, the APS Council has reduced page charges and has taken steps to minimize the publication time delay for nonpayment of page charges. This policy is working well and therefore will be continued. During my administration, we made an effort to examine the changing demography of physicists over the past decade and the implications that the demographic changes hold for the future. As more physicists find employment in industry and in applied areas of physics, there are likely to be shifts in the interests of physicists. To address the resulting issues, APS appointed an industrial task force under the leadership of Ted McIrvine of the Xerox Corporation. The report of the task force emphasizes the underrepresentation of industrial physicists in the governance of the Society and makes a number of specific recommendations for making APS more hospitable to industrial physicists. A meeting with leaders of physics in industry is planned for 1985 to make further recommendations. Last year was especially busy for the APS Committee on Education, as it focused on actions to be taken to upgrade precollege math and science education. APS is giving this topic high priority because of the current national concerns in this area, because of the special importance of precollege math and science education for the training of physicists, and because of the importance of such education for preparing each citizen to deal with the increasingly complex technological issues confronting our civilization. The APS Committee on Education has for the past two years worked very effectively with other professional societies to achieve common goals in precollege education. Now that my year as APS president has ended, it is refreshing to look back at the progress that was made. It is, however, difficult to assess at this early time the impact of the initiatives that are taking APS in new directions. Future presidents will support the best programs, and the weaker programs will die. The presidency of APS truly presents a window of opportunity. However, future generations must assess the significance of each president’s accomplishments. A small section, dealing with Millie’s research at the time, was extracted from the middle of the article above. The full text may be obtained at AIP’s Physics Today.